To qualify for a CDL in Arizona, you must be at least 18 years old, have a valid Arizona driver’s license and obtain a medical certificate. Interstate transportation of cargo is regulated by the U.S. Department of Transportation (USDOT), which requires drivers to be at least 21 years old to transport materials across state lines. Applicants must then pass both a written knowledge exam and an on-road driving test to obtain a CDL. For the driving test, you must use a vehicle in the same class for which you are trying to obtain a CDL license–for example, if you wish to obtain a Class A CDL, you must test in a Class A vehicle. To drive a truck with air brakes, a tanker truck, a school bus or a truck with double/triple trailers, additional endorsements may be needed. Endorsements may also be needed to transport hazardous materials or to carry 16 or more passengers (including the driver). A background check by the Transportation Security Administration (TSA) may be required to transport hazardous materials (also referred to as a Hazmat endorsement). 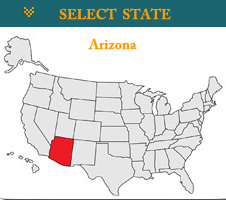 Truck driving schools in Arizona may provide the training and education necessary to pass the CDL exams.